What are the “Future Police” referred to on Harry Mudd's criminal record? 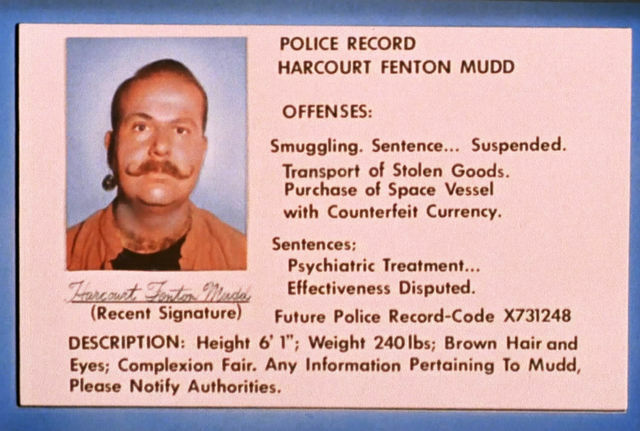 In Star Trek: The Original Series episode "Mudd's Women", we see Mudd's criminal record. It seems to me that this record code is used in the same way that "New York City Police Record-Code" would be used. What is the "Future Police" that this is referring to? There isn't any sort of time-traveling police after Mudd, so that seems odd. Or am I completely misunderstanding this line? Both in and out of universe, we can unfortunately only speculate. At the time it was written, it was probably included as something of a joke, or at least as filler. As presented in its original 480i NTSC resolution, and appearing on screen for only a couple of seconds, most people would not necessarily have even read the entire thing, so it was not meant to hold up to any particular scrutiny. This is true for a great deal of on-screen text--for example, the "Okudagrams" of TNG, DS9, VGR, and ENT all include in-jokes, and sometimes consist of nothing but random numbers meant to look futuristic but not really mean anything, because most people would not be able to really read them. We now know that Mudd had access to a time-manipulation device that allowed him to perform several heists, including almost stealing the entire USS Discovery and handing it over to the Klingons, killing Gabriel Lorca at least 56 times in successive loops in the process. (DSC: "Magic to Make the Sanest Man Go Mad"). If the Department of Temporal Investigations existed in 2256, they certainly would have taken note. Actually, given the nature of DTI, they might have taken note in 2356 or whenever, and then gone back in time and inserted a file reference! Point is, while it wasn't thought of at the time "Mudd's Women" was written, we now know Mudd is a temporal criminal! What are the symbols in the Enterprise's chapel? Why did they choose that theme song for Star Trek Enterprise? Has anyone been beamed into the future or past in Star Trek? What are these rooms on the Enterprise blueprints?